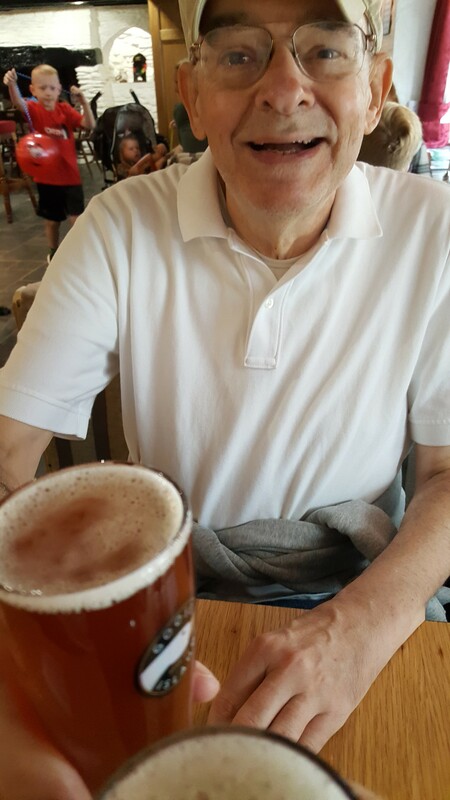 Thursday August 18….these are fraught days, trying to pull everything together for our 2+ week sabbatical in England (Cornwall and the Cotswolds). I have never been so tired getting ready for a trip! Just the technology alone is enough to make you shudder. New tablet, new keyboard, pass codes, TravelPass, WiFi apps and passwords, converters…may the stress all fade away the moment I board that plane! Monday August 21…on way to airport at 11…I am SO ready. Our flight on British Airways is smooth and uneventful (no sleep though). Tuesday August 22…I glided through Customs, and picked up my luggage, waiting a short time for David to make it through. It all took a little longer than we’d thought. We missed our first train at Paddington for Looe, so decided breakfast was a good idea (it was a full English breakfast, and it was goo-ood!) Then onward to catch 12 o’clock. On the train, we had a high adrenalin surge when a man boarded and began to rant at the top of his lungs, I forget about what. A passenger finally calmed him down. David and I both went into “blank stare” mode, as did the rest of the passengers. Nothing further happened, and the man disembarked at the next stop. Whooo! 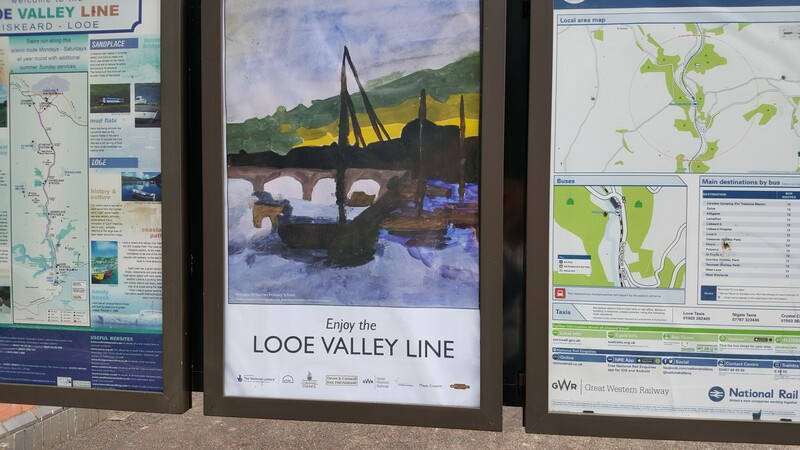 On the train from Paddington to Looe, we also experienced – quite by accident – our first “quiet car”. It was MARVELOUS. Very few people were in this car, but once we were seated, an older woman embarked, looking for her reserved seat and carrying on a conversation with herself– quite loudly. Once she found her seat, she proceeded to take out her cell phone and start another conversation at the top of her lungs. At which point, the conductor came down the aisle and quietly (!) asked her to move to another car if she wished to use her cell, as this one was a QUIET car. Which she did. As she moved away, we could still hear her voice drifting back through the corridor… It was all very low key and courteous. I do love quiet cars!! The ensuing silence, the sound of the wheels on the rail, and the foggy day lulled me into a short nap. But I woke up as the sun burned the fog away as the day wore on – beautiful views of the sea on one side, and green fields and trees on the other. We kept telling one another not to forget to ask the conductor to drop us off at Sandplace (part of the Looe Valley Line). How to start a fairytale? Take a tiny train to a charmingly small station (Sandplace) the size of a postage stamp, where you have to ask the conductor to stop the train and let you disembark! 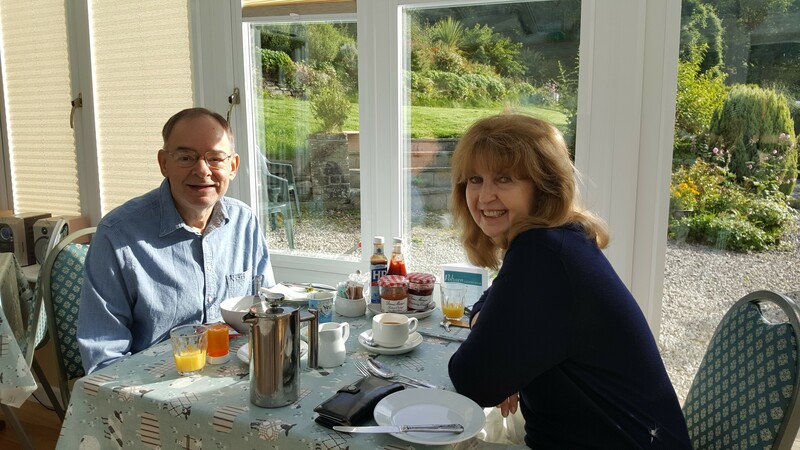 Gill, who with Martin, owns Polraen Country House, was waiting for us beyond the gate, and drove us the tenth of a mile home! Since it was a beautiful day, we had tea in the garden, and I took a deep breath. 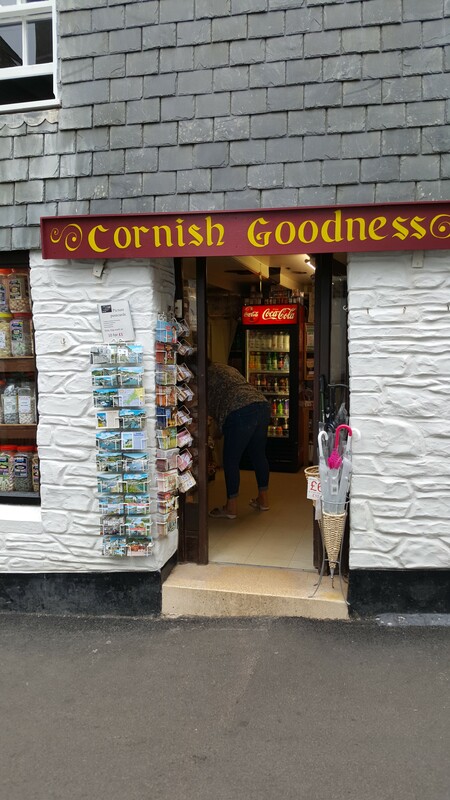 Here we are…finally, in Cornwall. 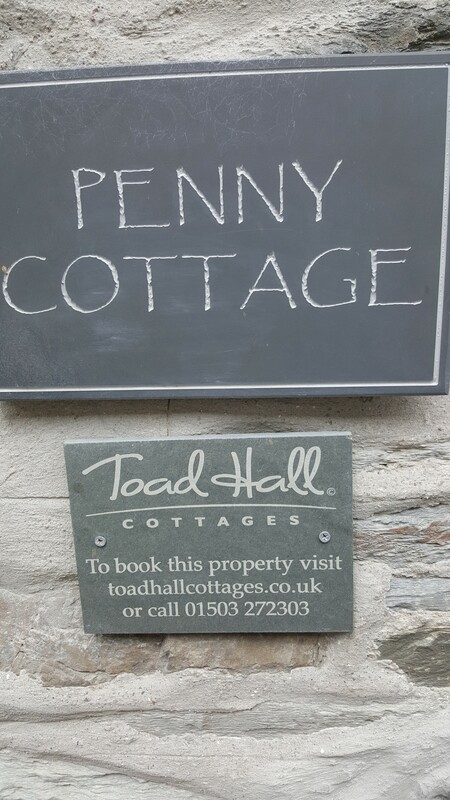 After a quick wash up, Gill drove us into Looe for dinner – to a charming restaurant called The Old Sail Loft. 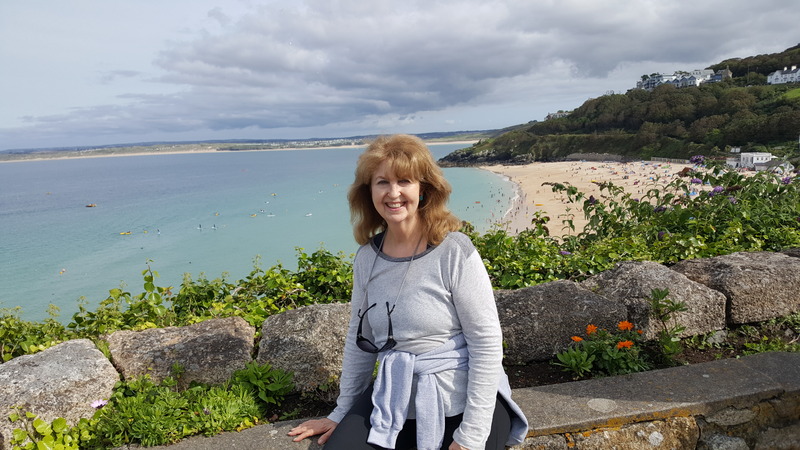 I opted for fish and chips – and when the order came, the fish, which was haddock and wonderful, was as big as the side of a barn – it looked like the sail on a boat. If only I could’ve finished it! It was light and crisp and totally delish – as were the chips, all soused with vinegar. This came with mushy peas with mint, a dish I have recreated since returning home…still yummy! 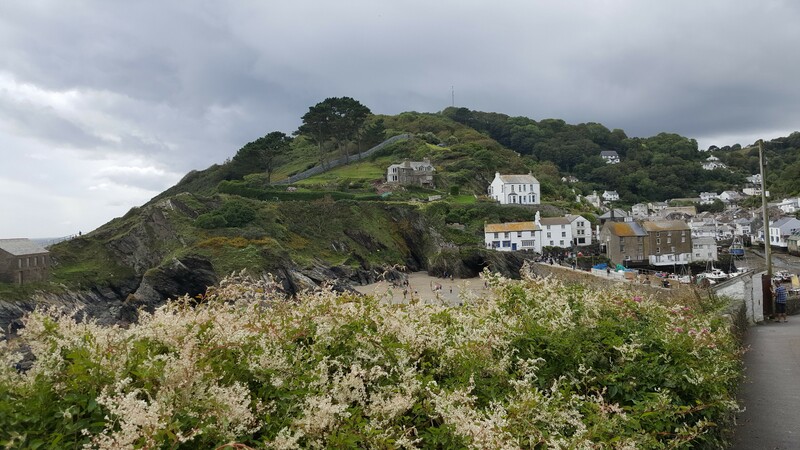 We then walked around Polraen’s garden, so intensely green it almost glowed…the day was overcast, cool and fresh with a few spits of rain, certainly not enough to prohibit our day in Polperro. I cleaned myself up, we called a taxi and we were off. Crystal Cars took us halfway down the hill into the village, and let us out close to a small stall selling whelks, cockles, prawns, and other seafood…we promised ourselves to come back for the cockles, but we never found the stall again! 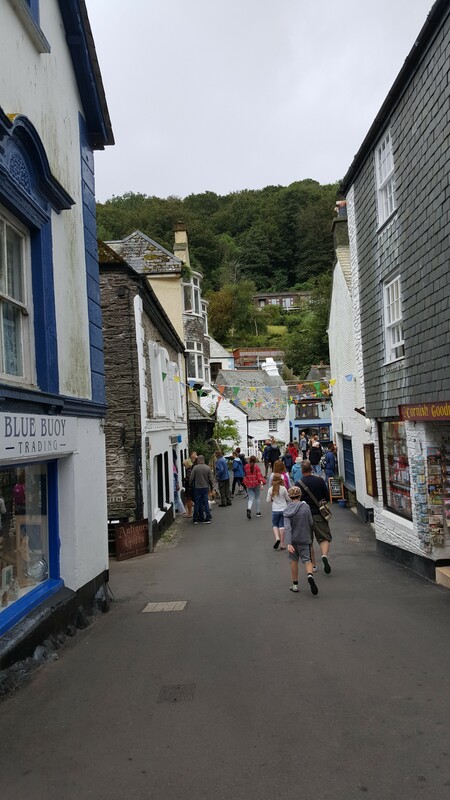 We wandered around all the narrow winding streets, taking in the tiny houses interspersed with shops, restaurants, pubs and galleries. Everywhere you looked was a picture. Houses were built into or hacked out of bedrock, stacked up on the cliffsides, looking out over steel gray seas – or the resultant mud/sand flats should the sea have receded. As the day wore on, the cloud cover burned away, the sun came out, and everything was bathed in the soft golden sunlight. 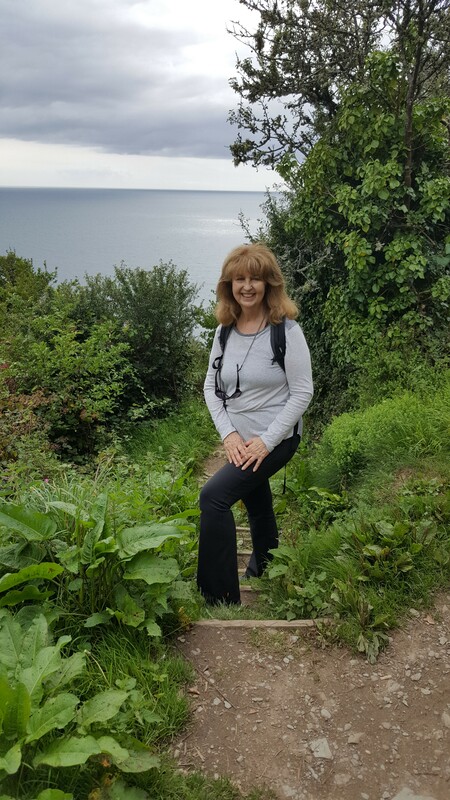 We found the entrance to the cliff walk to Talland Bay, and I was off, leaving David peacefully ensconced on a bench looking over low hedges of flowers to the sea and headland. 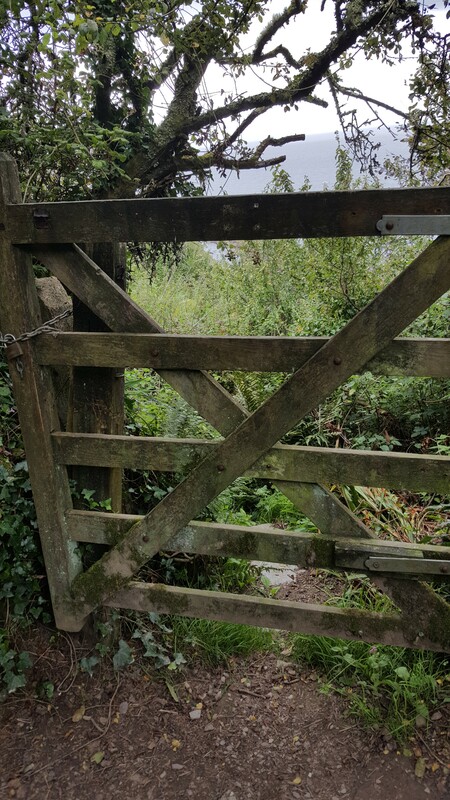 It was a wonderful walk…through high hedgerows, green and vivid or else splashed with flowers from freesia to foxglove and others I don’t have a clue about. 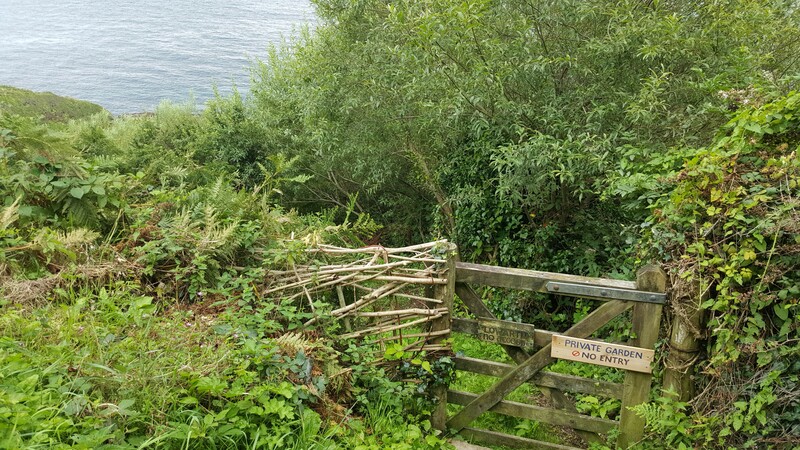 Gardens were hidden behind rock walls or old wooden gates covered in ivy and ferns, often with winding steps up to houses glimpsed between the trunks of trees. I was so happy. A gentle breeze ruffled the greenery, and it was about 70 degrees. 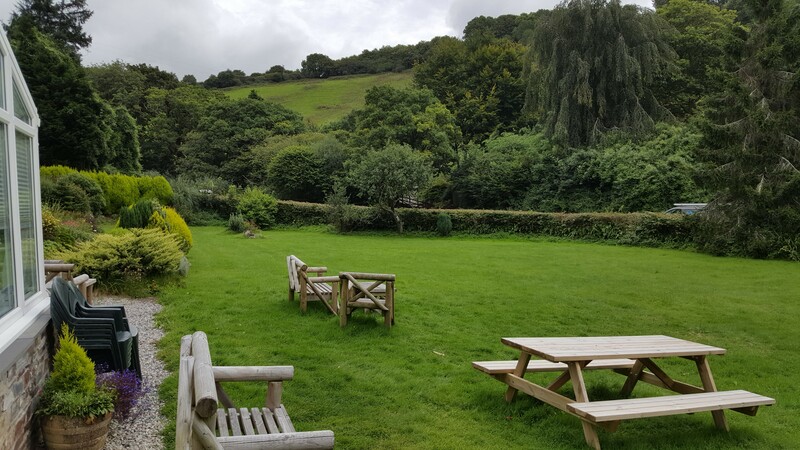 I finally had to turn around as it was getting late, met David and we wandered into the Noughts and Crosses pub for a half pint of the local Dartmoor IPA – perfect. And so home to Polraen Country House, where Martin made us crab and salmon sandwiches, which we ate out on the terrace in the cool air of the evening. A perfect day, in every way. 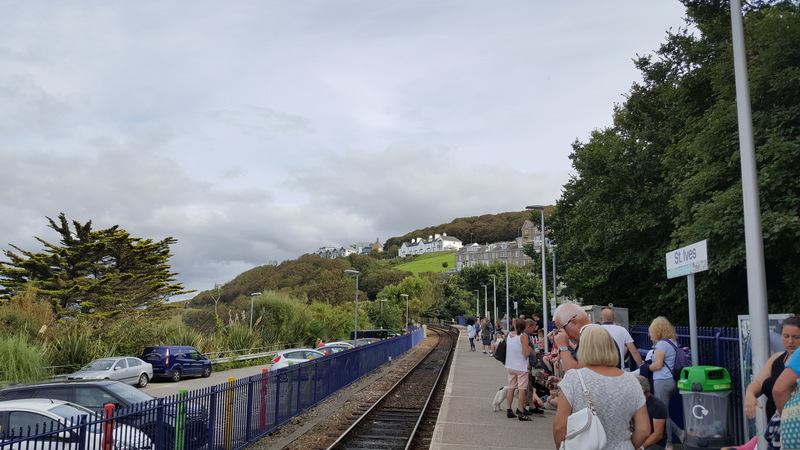 Thursday August 24…We decided to take the train to Truro and St Ives. The weather this day was absolutely beautiful from the get-go– sunny, warm with breezes. 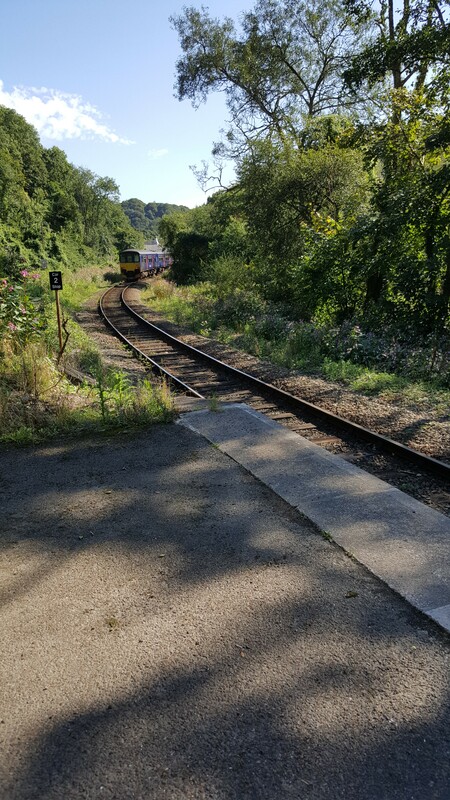 We flagged down the Sandplace train (one of my favorite things to do), and embarked for Liskeard, where we disembarked for the train to Truro via St Erth. 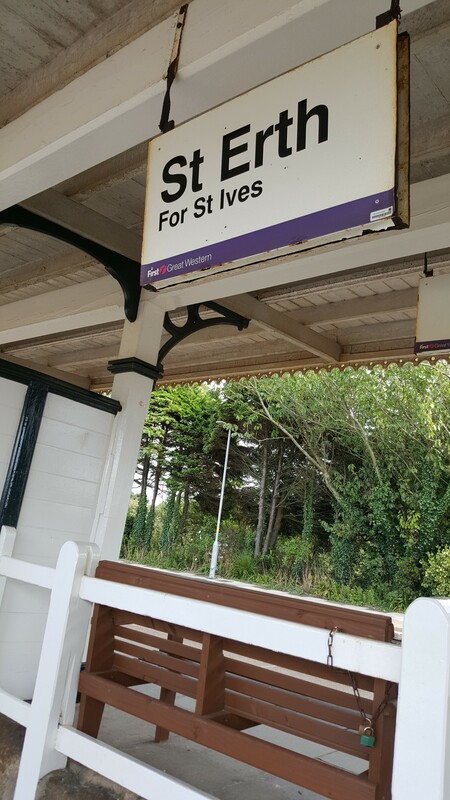 Poor David’s ankles were giving him some grief, but we made the train, changed at St Erth and got to St Ives around 4:15, only to find out we had to take the last train back at 5:30!! Somewhere in all this, we met a genuine eccentric named Susan who, I thought, was homeless. It turned out she was married, and “lived on the line,” by which she meant she rode the trains every day, all day long. Well known to all who lived around Looe, she was a fixture in the station and I was glad to have met her. 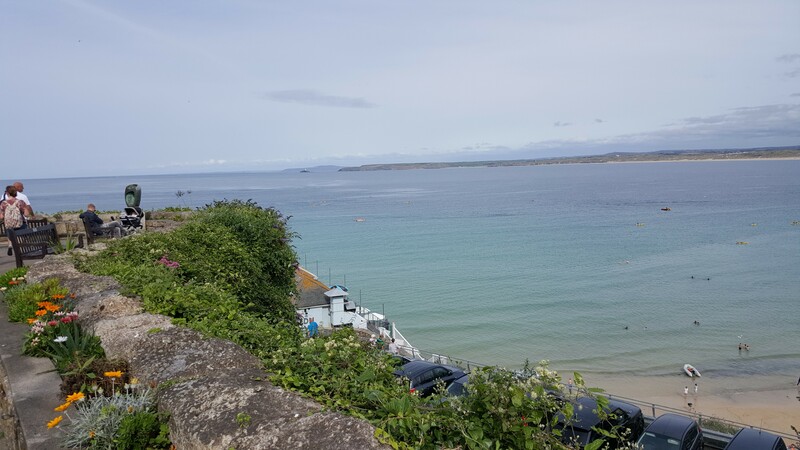 We managed to get to St. Ives without further incident. The sea and sky were crystal clear, the shore just beautiful, the weather incredible. Lots of people were holidaying…the car park by the station was packed. 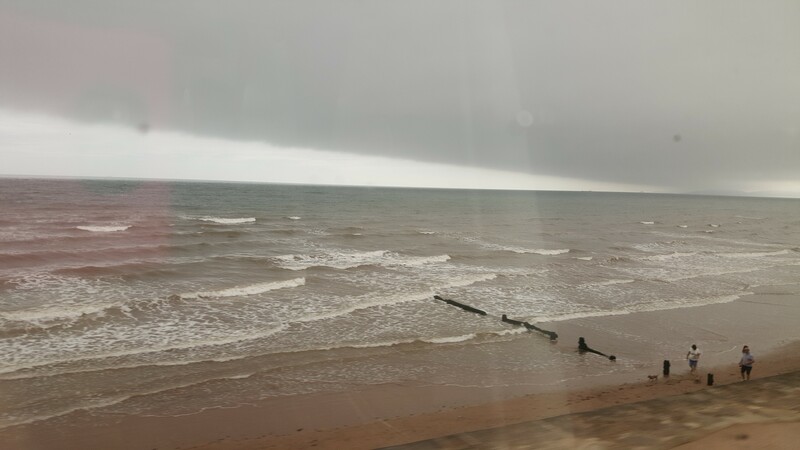 But time was running by us, and after a quick coffee, we were back on the train, and got to Sandplace at 8:40… then we had dinner at The Plough. 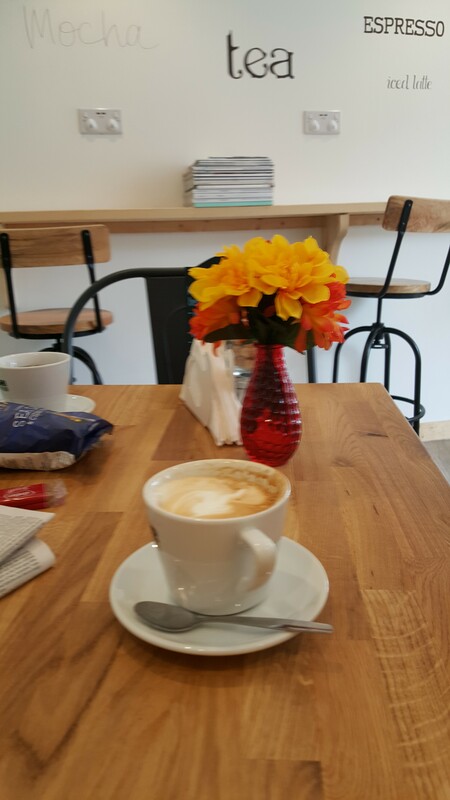 Lovely…but I was almost too tired to eat! Friday August 25… We awoke to a cool cool morning…so fresh and clean, sunny and bright, but what a wrench to leave!! I had my usual satisfying Polraen English breakfast…scrambled eggs, English bacon, grilled tomatoes, toast…yum-o! 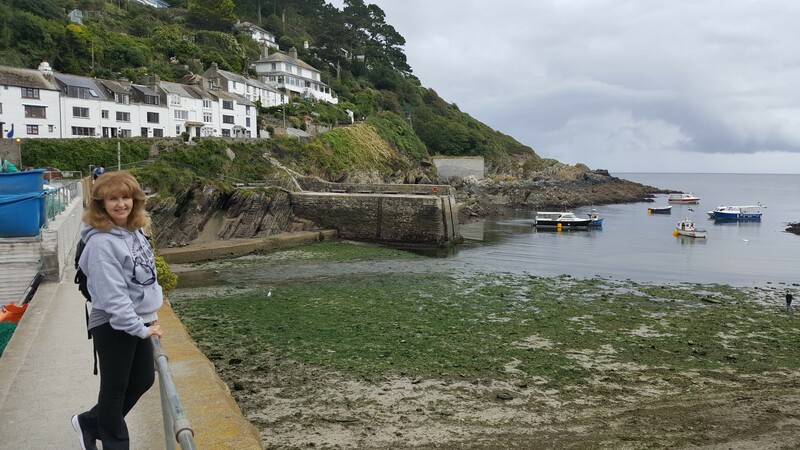 We’d packed the night before, but when it came time to leave, it was so hard to say goodbye to Gill and Martin and Cornwall. 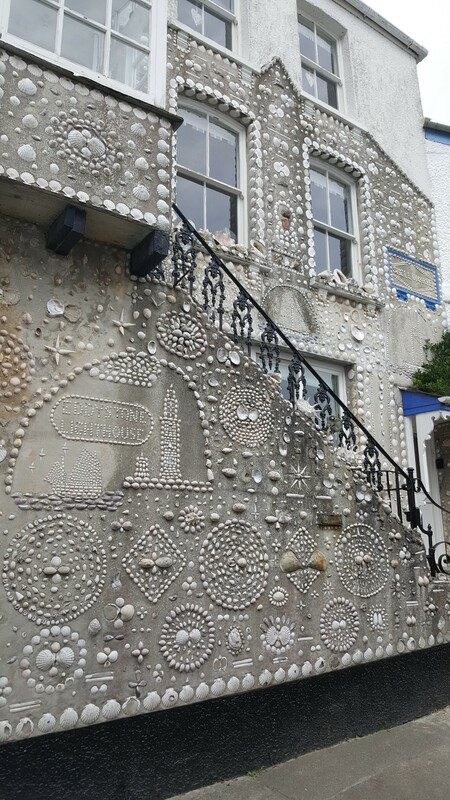 I love England, but there is something about Cornwall that is magical to me..walking on the pebbled narrow streets of Polperro, Truro, St. Ives, Looe…the houses, some hundreds of years old, built into, or from, the bedrock of the cliffs…its history, of pirates and smugglers, Cornish pasties, hidden caves, the sea constantly slashing the rocks at the cliffs’ base, the narrow footpaths framed with hedgerows as old as England, sometimes too high to see down to the sea below…I adore it. 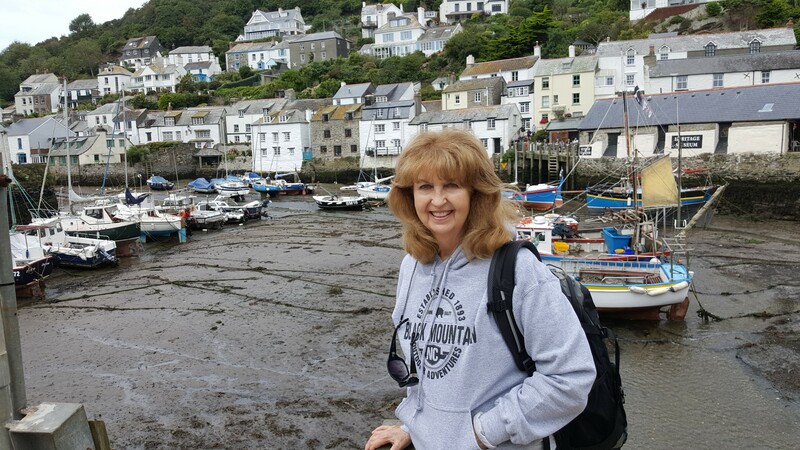 Loving Cornwall goes back to my mother who was born in Mousehole, as were my grandparents and their parents…it’s in my blood. 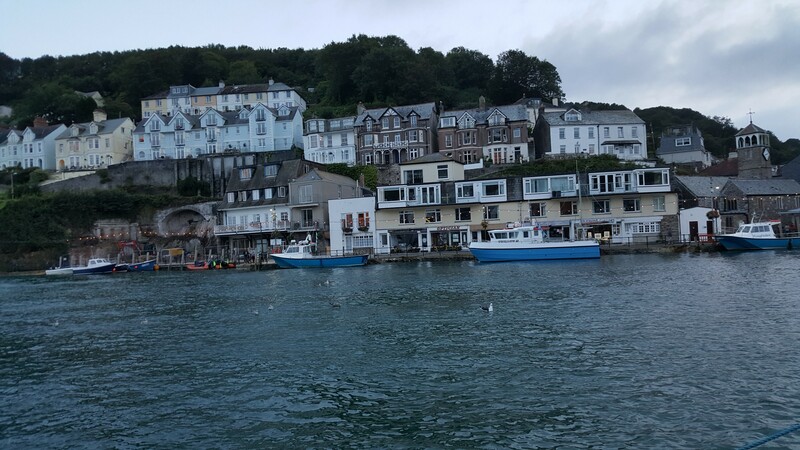 England is magic everywhere you turn, but Cornwall has its own special brand of magic: mysterious, especially under lowering gray skies, the winds from the sea, the timelessness of path, water, air and the call of the seagulls. and then we changed at Liskeard (but didn’t see Susan) for a three hour ride to Reading, changed again for final trek to Moreton-in-Marsh, where Steve our taxi driver picked us up. And then on to Broadway…and a gentler, more pastoral sort of magic. 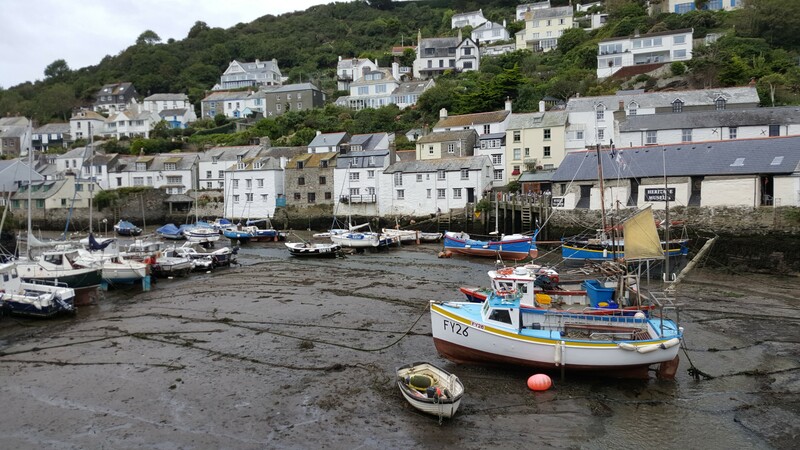 Posted in Uncategorized and tagged Cornish pasties, Cornwall, Cornwall Magical rambles on the coast, England, English bacon, hedgerows, Liskeard, Looe, Looe Valley Line, Mousehole, Old Sail Loft, pebbled narrow streets, pirates, Polperro, Polraen, Polraen Country House, quiet car, quiet cars, Sandplace, Sandplace Station, smugglers, St. Erth, St. Ives, Talland Bay, The Plough, Truro. Bookmark the permalink.